First of all, what is this with sugar? Look, sucrose is just fine and agave syrup, honey and HFCS are chemically the same. All four of those items are SUGAR. The fact that you need sucrase to digest (hydrolyse) sucrose does not make it less diet. This is not a mistake I would expect of top chef. And the BS about agave syrup being lower on the glycemic scale is because said scale measures only glucose not fructose and fructose is no magic bullet. Sugar is sugar. Any pastry chef should know this. Now for the challenge, these chefs need to get out and eat more food at better restaurants in order to cook better food. If you do not go to fine restaurants and eat fine food all the time, how would you expect to be a good chef? Everytime I go out to eat, I analyze, I criticize, I eat. Oh, Toby, Toby?, where is the wit? Get on the stick. Go Bourdain on these guys. You call those comments rough? Not in my sandbox. Come on people! Step up your games. Tom, I love you. Only in a platonic sense, mind you. ;-) I think I'll keep you. Good job. Wow, this is a great natural food store and buying club. They may be small but they are mighty. And now they are vegan Life by Chocolate. That is fantastic. I'm bumping this up and submitting it to The Alchemist Chef's Valentine's Day Recipe Competition. Indeed, as previously reported in this blog, we have been hand picking fresh, sun warmed apples from a local orchard that a friend of ours owns. 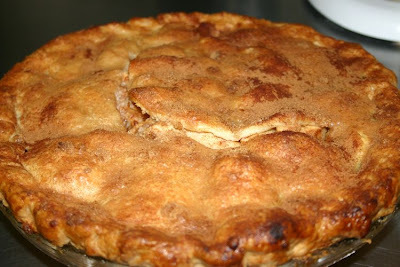 You've seen the pictures of the apples and orchard now see the apple pies. And I do mean pies. 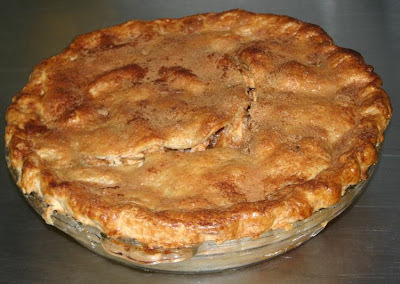 Currently, we are making two different versions of the apple pie. 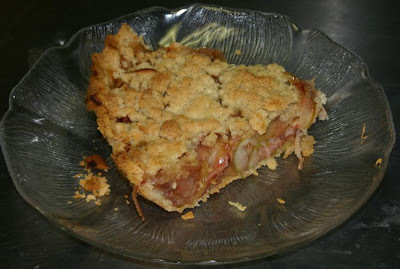 One is more of a Dutch apple pie, made by Marion, my French Sous Chef. Marion is a baker who also doubles as a personal chef. So, if you live in the NY capital region or even in the city, and need a personal chef, Marion is your chef. When she isn't working here that is. 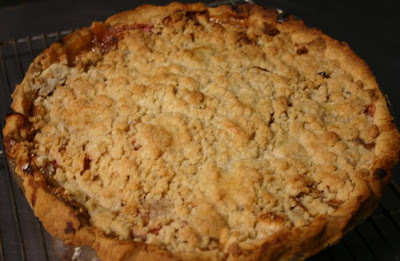 The apple pie that I make is more of a French apple pie and it has a streusel topping. This is heavenly and a beautiful pie. First though, the most important step, the crust. Both versions of this recipe use my crust recipe. I've been making the crust for both of these pies. The most important thing about making the crust is to not over mix the crust. As soon as the dough looks like it is holding together, you stop. 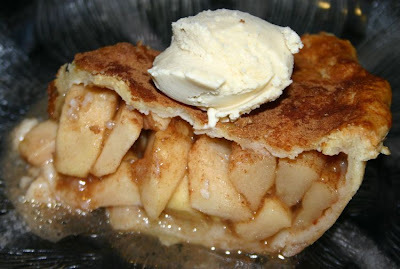 The Dutch apple pie has both a top crust and a bottom crust. Use a deep dish pie tin, I actually prefer glass, to make both of these pies. Slice of French Apple Pie. NB: This is a very crumbly pie. Take care when cutting it. 2 1/2 ounces butter chilled but not frozen. 1 1/2 ounces butter chilled but not frozen. Combine the dry ingredients and mix. As you are mixing the dry ingredients add the shortening and butter until you get a pea like consistency with the dough. Add more butter if needed but do not go over 3 ounces for two crust or 1 1/2 ounces for single crust. Make sure the butter has been siting out of the fridge for 1/2 hour, it should be cold but workable, and that the shortening is chilled as well but not frozen or hard. Next add the vinegar and beaten egg. Then slowly pour in the 1/2 cup ice water until the dough starts to come together. As soon as it comes together, stop adding the water and stop mixing. Wrap the dough in plastic and let it rest for 4 hours. Trim and crimp and don't forget to dock, that is fork, the dough well. Cover with plastic and refrigerate. 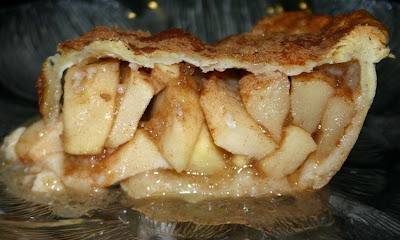 For the Dutch apple pie, core and peel the apples, I like to use Empire for this pie, and cut into 8-10 sections. Add about 1/3 a cup of sugar, 2 tablespoons tapioca, salt, lemon juice and cinnamon and toss together, taking care not to mush the apples. Fill the prepared bottom with the filling. This pie needs to mound. Bake at 425F for 15 minutes and then continue baking at 375 for 35 - 40 minutes. When the crust is golden brown, it is done. 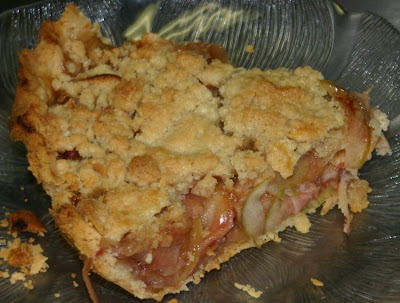 The important part of this pie is to core the apple, do not peel, and slice very thinly. I like to use the 1mm setting on my Cuisinart to slice these apples. Make sure that as you slice them, add the lemon juice. You may use up to 2 T of lemon juice. And make sure the apples are well mixed. Then add the rest of the ingredients and gently toss the thinly sliced apples, mixing the ingredients. Next, lay the apples in a spiral starting from the edge and working inward until you build up a big mound of apples slices. The bigger the better. Again, this is a mounding pie. Feel free to use 2 Rome apples if needed. Cover the top with a generous amount of streusel topping. Combine 1/3 cup of brown sugar, 1/2 cup AP flour and 1/3 cup of butter. Mix till you get a nice crumbly topping. Bake for 15 minutes at 425F and then lower to 375 and continue baking for 45 minutes or until the streusel topping is slightly browned. No matter what pie you do, let cool on a rack before serving. You may serve this at room temperature or warm. Add some cinnamon ice cream and you have a favorite dessert here at the Arms. Dress it as you wish.